Whoops! Maybe you were looking for Sissy? George McClellan pictured after his mom combed his hair and visibly suffering from Itchy Chest Disease like Napoleon. Note how his mom parts his hair to the right and not to the left. 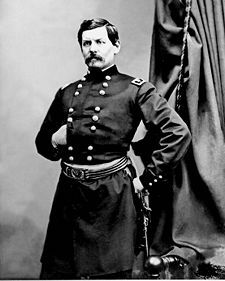 George Brinton McClellan (December 3, 1826 – October 29, 1885) was a general and politician who ran for president and lost in 1864. 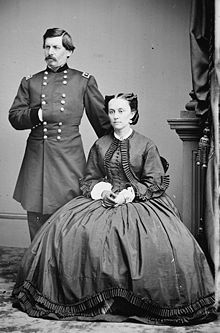 He served as the leader of the Army of the Potomac during the American Civil War, and briefly as the General-in-Chief for the United States Union Army. McClellan was well known for being an incredibly meticulous general, a trait in large part a result of his OCD. McClellan would often refuse to send troops into battle until they were lined up "just right." McClellan's legacy as a general remains unclear; while many historians claim he was ultimately responsible for the early failures of the Union in the Civil War, a small but vocal minority insist "nuh-uh." After failing miserably at being a general, McClellan decided he was much better suited to fail miserably in politics. This page was last edited on 12 December 2014, at 02:53.